Christmas may be over, but we are are still celebrating! River Lights of Wonder was a huge success for our first year! Thank you to all who generously donated and gave of their time to the vision: To offer families a meaningful Christmas Experience, free of charge. Thousands drove and walked through to see the lights reflect off the water on the St. Joseph River. They also heard the story of the first Christmas.We are looking forward to what next year holds for expanding. If you would like to play a role in helping next year’s vision come true, we appreciate your prayers and financial gifts. Thank you, City of Three Rivers! We want to thank the City of Three Rivers for their support in helping the River Lights of Wonder be such a great experience in 2018! We appreciate the positive and helpful ways they came alongside us to carry out a pioneer vision. The result was thousands of visitors coming to Three Rivers to experience the festive and reflective lights on the river. Great unity and people getting the vision to help families experience Christmas. Great and free coverage from WWMT Channel 3 News and local papers. Click the links below to check out some of that coverage! People traveled here from distant areas such as Holland, MI, Allegan, Detroit and various Indiana cities. “Candy Cane Maze” was a fun Family activity that was used every night! The original idea came from a childhood memory of being in a struggling family at Christmas time and finding Christmas lights. A passion of Riverside Church is to strengthen families (especially struggling families) in our community and surrounding cities. We already knew that families love to drive to places where they can see Christmas lights and understood the need for free events in our community. A desire to see the city of Three Rivers become a “Place to Go" for Christmas attractions in Southwest Michigan and Indiana. HOW DID WE DO IT in 2018? The vision was to offer families a drive-through and walk-through experience to see festive Christmas lights reflecting off of the St. Joseph River. It was to be free of charge. We shared the vision to our church members and gave donors the opportunity to give. Even children gave toward the vision! Our electrical power source for 2018 came from our newly purchased Hope United House. We were granted permission from property owners (including the DRC and Wards) to use their land on the river’s edge to construct our trees and mountain range of lights. Everyone was extremely cooperative! We had licensed electricians and professionals who gladly donated their skills. We rallied countless volunteers (including gentlemen from the probation center) to clean up the river’s edge and however else they could help. We hosted a free Family Day, which was a great success! 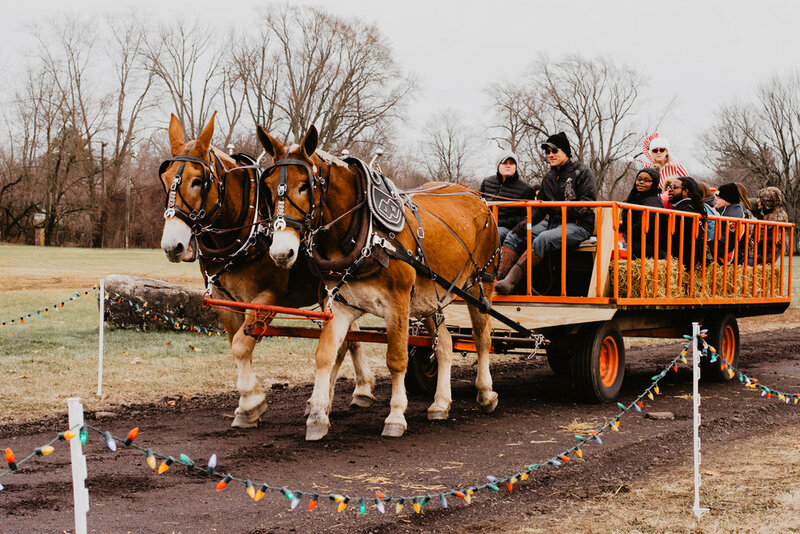 It included sleigh rides, animals, refreshments, a Candy Cane Maze, Mickey and Minnie Mouse, and children’s indoor and outdoor activities. Continue lights on the St. Joseph River towards the bridge. Flood Lights on bridge with city permission and perhaps funds. If you would like to give toward next year’s vision for River Lights of Wonder, press the link below.